I am a Salmon lover, I know many people are not fans, but I love it. Sadly Matt doesn't like it so I don't cook it too often. I just discovered Sterling is like his Mama and loves it too. If you have kids give it and try and serve them some. I was shocked when Sterling ate it, he is such a picky eater always. He called it pink fish and gobbled it up. What makes this dish so good is the relish on top. So if you hate Salmon by all means use Grilled Chicken or a different fish. I think it would be great over Flounder or Mahi. If you do use Salmon, buy the Wild Caught kind. That is the only kind we buy, it is so much better for you and I think it is not as fishy as the regular or farm raised kind. This recipe came from one of my mom's dear friends and it is down right delicious. So fresh and healthy, plus it looks gorgeous. Perfect for a dinner party! Mix together Tomatoes and next 6 ingredients. Let sit at room temperature for 30min- 1 hour before serving ( I actually let ours sit 2 hours +, I think it tastes better the longer it sits). Do not refrigerate. Lay Salmon on a foil lined baking sheet. Drizzle with olive oil and a generous amount of salt and pepper. Bake the Salmon at 400 degrees 20-25 mins. Do not overcook, you can test with a fork to see if it is done. If the fish flakes easily with a fork it is done. Serve the Salmon with the relish and enjoy! This looks amazing!! I wish I could eat salmon but I just can't get myself to do it!!! Every time I try it, it tastes too fishy. I may have to give this a try though because it looks too good!!! That looks so good! 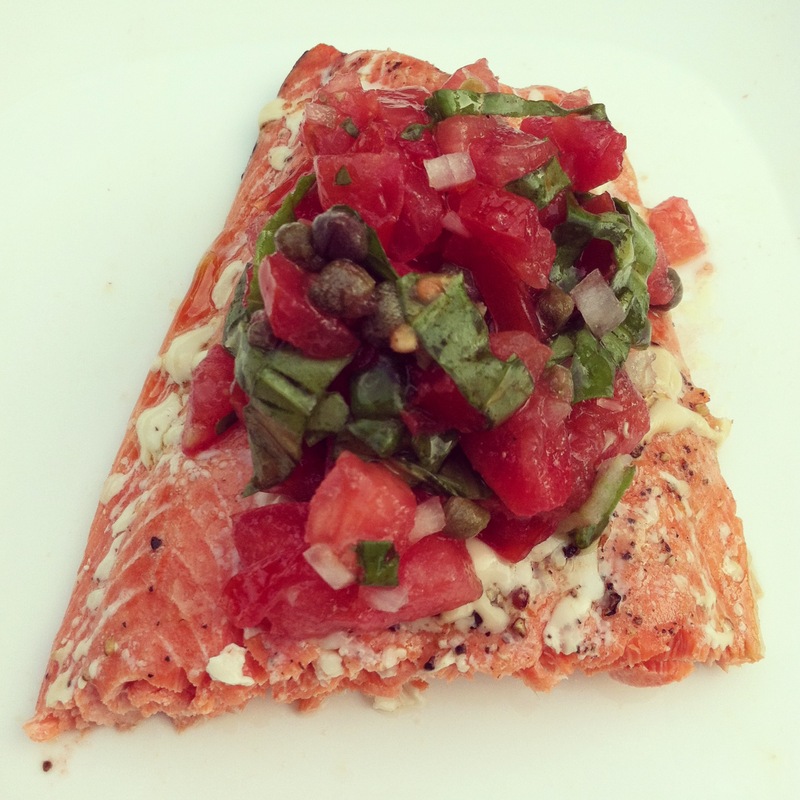 I am sure it is just me but I think that salmon and capers are a perfect combination! Looks so delicious! Will be trying this one for sure. This is definitely a must-try! It sounds amazing! Loving the new look mama! Just wished I was loving salmon because this looks really good!!! Say what the what!? Your site design is majorly GORGEOUS!!!! Wowsers. Blew me away. A favicon and everything. Rock on with your bad self lady! I'm so jelly beans! The salmon looks tasty too!!! Love the new site design!!! Salmon looks delish, my 10 yr old daughter is crazy about Salmon and begs me to make it all the time, thankful she has my taste buds and not my husbands. WAIT! Loving your new blog design! Looks amazing and love your new blog design! Girl the new layout is amazeballs!! Oh shoot, I'll eat it with you anytime. I'll bring dessert! This looks divine! Love your new site design, too! Very pretty!! It is only 10 am and I want that RIGHT now. lol. Looks delicious. ohmygosh --- your new blog looks amazing!! I love it!! yum! Will have to try this - we love salmon! the new blog layout looks great! This looks amazing! Love the new look of your blog!! It looks awesome!!! It's amazing that Sterling will eat salmon! How adorable that he calls it "pink fish". Thanks for sharing the recipe, will definitely try it out this weekend on my boyfriend (who I usually don't cook for, so he won't know what hit him!). The new blog design is GREAT!!! Hey Natalie! I've been reading your blog for awhile and recently started one of my own! I was the girl who emailed you about the a thread dress a while back! This sounds yummy! I love me some salmon! Yum! I've made a similar recipe before and it's so perfect for summer! My husband doesn't like salmon either so I really have to jazz it up to get him to eat it! My hubby and I are both salmon lovers. This looks so delicious. I will be making this over the weekend. We try to eat salmon at least once a week. Thanks for your recipe! Your blog looks great Natalie! Fun change! Perfect and Light for these warm nights here in Southern California.